Today is the day: Windows 8.1 is now available as a free download for all Windows 8 users. The update includes several new and enhanced features, and notably — perhaps infamously — marks the return of the Start button to the Windows desktop environment. To receive the new version, all existing Windows 8 users need to do is launch the Store app in the modern UI. The Windows 8.1 upgrade will appear as the first large tile on the left; clicking or tapping on it starts the upgrade process. If you're on an earlier version of Windows, the Windows 8.1 upgrade costs $119.99 for the regular version and $199.99 for Windows 8.1 Pro. DVD copies of Windows 8.1 will also be for sale in some stores. Windows 8.1 is the first major update to Windows 8, which completely revamped Windows for touch devices when Microsoft formally launched it about a year ago. Microsoft added many organizational tools — including a more customizable Start Screen, better multi-monitor support and a "global" search — but it also responded to user feedback by reversing itself on some key design decisions. The most obvious one will be the return of the Start button on the Desktop. While the new button is just a quick doorway back to the Start screen (and doesn't have its own pop-up menu, as in previous versions of Windows), its return has been the source of much discussion, with some saying it represents a capitulation of sorts for Microsoft. Windows 8.1 also includes a Boot to Desktop option, another highly demanded feature Microsoft left out of the initial release of Windows 8. 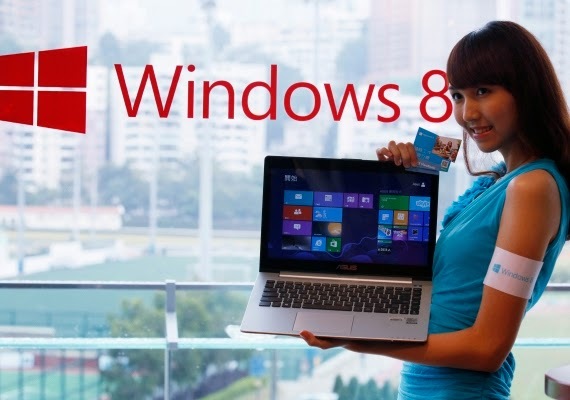 What Windows 8 users are most looking forward to, however, are the new toys. One of the most powerful is the new Global Search function, powered by Bing, which will return an intelligently parsed search "hero" with organized information on whatever term you type from the start screen. For example, searching for "Lady Gaga" will call up the musician's Wikipedia entry, relevant videos and songs that can be immediately streamed from Xbox Music — in addition to a visually driven list of relevant links. Windows 8.1 also features deeper integration with SkyDrive, Microsoft's cloud-storage service, and it becomes the default place to save new documents. Every file on SkyDrive has a "placeholder" file on the device, similar to an alias, that lets the user interact with the file as if it were local (it shows up in searches, has a preview, etc.). The placeholder files allow users to have fast access to files while keeping device storage open. Another feature that will relieve many users is the auto-updating of apps. Like iOS 7, Windows 8.1 will simply download and install updates to apps when they're available, making manual updates (and the dreaded number on the Windows Store live tile) a thing of the past. For a full rundown of the new features in Windows 8.1, check out our guide, and browse the gallery below.